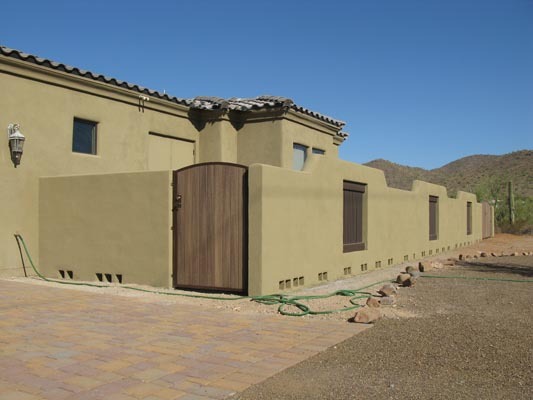 To date, Progressive Fence Corporation has thousands of satisfied customers in Arizona. We take pride in being recognized by Better Business Bureau as a rated A+ company for our quality work and have been a member since 2004. We have established an exceptional reputation in providing exactly what the customer needs. Our customer referrals give insight of our work— they are people like you who are looking for the right company. We guarantee that we will provide the finest craftsmanship and service. Continually innovating techniques to create formidable foundations and superior construction. With over 1000 + projects completed, we have mastered workflows to perfection. We work hard and quickly turnover projects with no delay. We know the importance of managing quick results with quality. Every project is carefully planned and executed. We know all of Arizona's city policies and codes and excel in every one. We use the best materials and take no shortcuts in building your vision—whether it be in your backyard or commercial. Team dynamic provides over 15 years of experience in the industry, providing exceptional results. Jonathan, we were so impressed with a job well done by your crew! You were very honest and upfront with your bid explaining in great detail how you would construct our block wall. Your crew came as planned and amazed us with their workmanship and efficiency in getting a job well done! We were very impressed. We will definitely recommend you to our friends. We want to thank you for a beautiful job and you were done way faster than we expected. 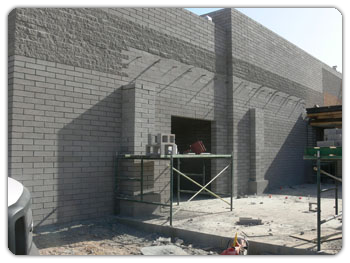 We will recommend you to anyone that needs a wall or other masonry. Jonathan, You have done such a great job at our house that is now a home. Your workers were so respectful of us, our property and their work considering the very large area (our house sits on over an acre) they had to cover. Their work reflects you and the kind of company you run and the work you do which in our opinion is bar none. The wall is nothing short of what you said it would look like but way more than what we thought. The wrought iron fence is top notch and again beautiful. Everything is beautiful and we smile each time we pass through the front gates. Our home now looks like (what you said) the best house on the block. People slow down to look at the spectacular job you did. As for the gates, all we can say is WOW! they are beautiful. We had no idea they would be so beautiful and am glad that they are visible to the street so others can see the beauty that now surrounds our home. All in all, we give you a 10+ for the workmanship, set up, and clean up, I would recommend you to anyone and everyone who needs a wall. Please feel free to post pictures of the wall, the fence, wrought iron, and of course those beautiful gates. I needed a company to remove an unsightly Oleander hedge that ran for 100 feet from my back yard wall to the street. I wanted to replace it with a stucco block fence. Jonathan came out on a Sunday morning and gave me a quote which was quite fair. Jonathan called for Blue Stake and secured the City of Phoenix permit. He was able to start in couple days and showed up exactly when he said he would. I was absolutely blown away at how fast they progressed. The Oleanders were gone by lunch and the footing for the wall was dug and the concrete and rebar in place by 4:00PM. The next day up went the wall. 71 feet of six foot wall and 35 feet of 40" wall per code. Grouted columns every 10 feet to match my existing. Only 2 days have gone by! The next day right on time he came stuccoed the wall, cleaned up the mess and was gone by noon. Amazing! and it looks fantastic. Jonathan and his hard working crew really know what they are doing and I highly recommend Progressive Fence Co.
Stellar service at an unbeatable price. Jonathan and his crew did a fantastic job created a very large patio wall extension for me. I was delighted with the professionalism and attention to detail. County permit took 1 day! Efficient, reliable work, and excellent clean up afterwards. Finally— a contractor that knows what he's doing, and is ethical. My wife and I had Jonathan and Progressive Fence build a 150' block fence across the front of our property. It connected two already existing fences and the dig was in New River (which has extremely hard ground) which made the job particularly challenging. 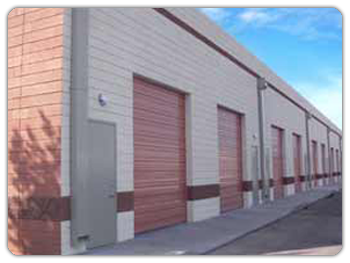 Jonathan was punctual, provided an accurate estimate, and the job was done extremely quickly. Permits were taken care of in only a day or two. Even when the trencher broke due to boulders in the ground they came back the next day with a backhoe to finish the job. When they painted they were able to match the paint color almost exactly to the existing fence. Jonathan came and checked in on things and his workers were extremely professional. The construction and quality of the fence are superior and we could not have asked for anything to be done differently. He was considerate of our drainage concerns and in fact our property has even better water runoff than before the fence was there. I would absolutely recommend Progressive Fence Corporation for any type of fencing or gate work. Excellent Craftsmanship, Jonathan and his crew arrived on time and demolished a 10 FT existing block wall with gate that was falling down and had been anchored to the house which is something a contractor should not do. Jonathan explained the previous installer had not installed the footer correctly also you are not supposed to anchor a block column to the house with angle brackets. During the demolish we observed the footer was only 18 deep and the new install was now 36" deep since it was against the house column. They also did a 12FT wall on the other side of the house which had been wood and falling down. I called four different contractors to get a competitive bid process and some vendors would not touch a job unless the price was over $3000 and since this was a small job less than 20 linear feet two would not bid. Progressive fence stepped up to the plate to complete the job at a fair price and did it right. I also noticed that the original contractor did not even put horizontal re-bar in the footers. I am amazed at the type of poor work others contractors are doing out there so you should stay away from bad contractors and go with a good one like Progressive fence. Give Jonathan a call he will do a great job that will last a long time. 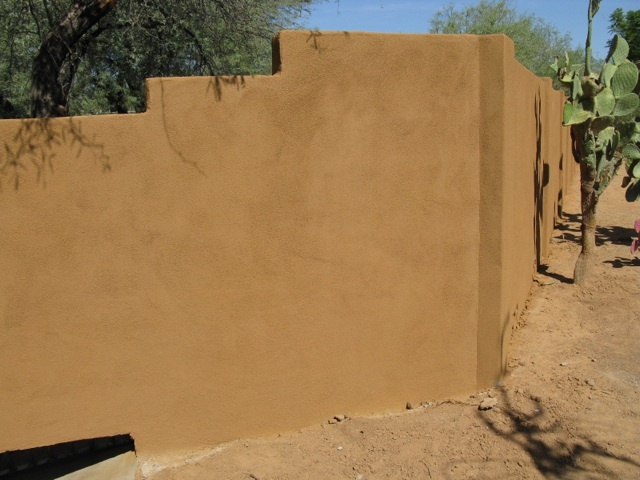 I was out of state and had to get a wall constructed in Arizona. It was stressful trying to choose a company to do the work when I wasn't there. I chose Progressive Fence Co. because their website had a ton of information and great pictures. Jonathan answered all my questions and concerns in a very timely manner, sometimes within minutes. He explained everything in detail, gave me a very thorough estimate and did all the permit work, which was huge. Jonathan's pricing was very good and reasonable. His team was there exactly when I wanted them to start and they were finished in four days including cleanup. They left my yard and the neighbor's yards very clean. They were all very professional and worked very hard. Jonathan was on site much of the time working beside his employees, which was very impressive. They all worked very well as a team and did an outstanding job. They did a beautiful job putting up the block wall and installing two gates. It was an awesome experience for me and I would recommend them to everyone. Good Morning Jonathan, I just wanted to tell you thank you so much for getting the work done in such a professional and timely manner. 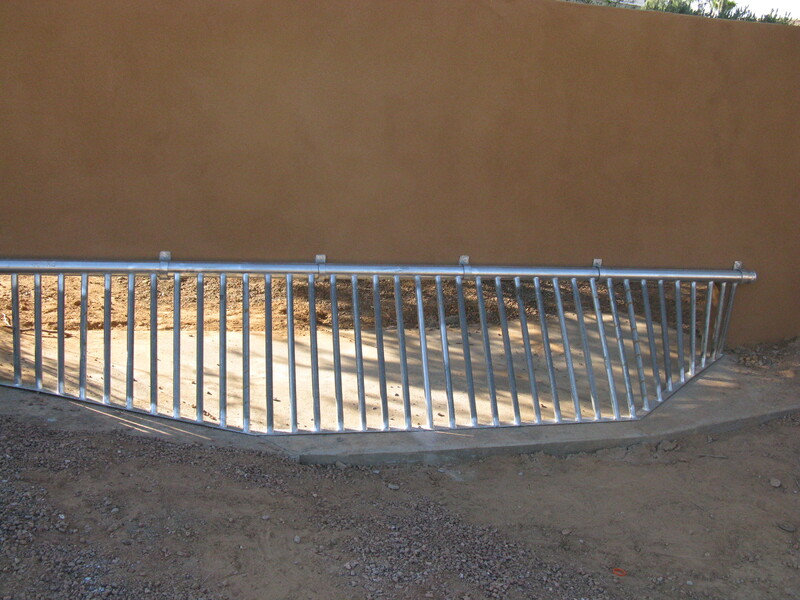 I love the gate - It is very attractive and looks to be very stable and weather resistant. Great work - Great Job! I want you to know how happy I am with the block boundary fence, walk through gate, and RV gate at our residence in Desert Hills. As you know, I started this process while I was still living in Illinois and I want you to know how pleased I am with your help in getting the proper design and the correct permits. Your workers did an exceptional job. Thank you for your design suggestions and the quality of work you did. If you ever need a referral, send them my way. Working with Jonathan (Progressive Fence) was very easy to work with during the whole process, from the estimate through the final block and gate. Jonathan and his team were very respectful to my neighbors (and their property) who all had nothing but praise for the team and the fence they built. The neighbors keep telling me they have never seen such a great fence from the solid foundation to how straight the fence is. Thank you Jonathan and your team for a job well done! Progressive Fence Co. Corporation recently, June 23, 2010, completed the construction of a slump block fence, a patio and four slump block columns at my residence. The completed fence is approximately 90 feet in length by six feet in height and has a four foot by five foot gate opening. The integrty and quality of workmanship was excellent. The owner of the company coordinated the orderly delivery of all materials so that there never was a stoppage on the job site due to lack of materials. He was on the job site daily to insure that the job was progressing as laid out. The job site was kept clean and safe at all times. The crew was courteous and the owner was available and responsive to any questions or concerns that I had. The job was completed in a timely manner to my complete satisfaction. Within a couple hours after the job was completed I had people from the neighborhood stopping by to to comment on the excellent quality of workmanship and timely manner in which the job was completed. I highly recommend Progressive Fence Co. Corporation. I will have work done by them in the future. I wanted to contact you and let you know how happy I am with the fence you did for me. Your men were respectful, your work was on time and to high quality. You left my yard raked and all debris hauled off. I would recommend your company to anyone. I am new to writing reference letters, but I wanted to share my great experience with anyone who may consider hiring Progressive Fence Corp. for their fence or any other outdoor home improvement project. This company, under direction of Jonathon Neri, is totally on time, professional and amazing in the delivery of what is wanted/needed to build, repair or replace block walls of any kind. Jonathon is a hands-on coordinator with his men. When he said he’d be at my home at 5:30 a.m., he and his crew (in clean trucks) were there on time. I had my block fence raised, one whole section replaced, and had my block fence extended. I also had a decorative slump block fence installed around the front of my property. I love it all. Jonathon also arranged to have colored/stamped concrete poured on my property. That turned out very nicely, and I am pleased. Progressive Fence is dependable and very good at their trade. His crews are very nice, hard working men. The grounds were always left clean at the end of their workday. I am happy I found them. I wanted to thank you and your crew once more for the excellent job you did on my property. After the big storm in January I was faced with coordinating several repairs to the house as well as dealing with the insurance company. I found Progressive Fence Corporation on the BBB’s website and gave you a call. Despite the fact that it was late on a Friday afternoon, you answered the phone and right away began to make me think I had made the right choice. To my surprise you offered to come out the next morning, a Saturday, to do the estimate. From the first day we met until the job was completed you provided me with an elite level of service. The work crew (which amazingly included yourself!) was completely professional and it is obvious that you all take great pride in the work you do. Rest assured that I will recommend Progressive Fence Corporation whenever possible. Thanks again; keep up the good work! I just wanted to take a moment to thank you and your employees for a job well done. It is unusual in today’s work place environment for contracts to be completed on time meeting all its parameters. Let me review our agreement. It called for the removal of the existing redwood fence and replacing it with a block fence with two gates in three days, In order for the work to be accomplished the redwood fence with its 4×4 fence posts sunk in concrete had to be removed. Also, your crew had to dig a 12in x 12in trench for the new fence foundation as well as dig the 3ft x 12in holes for the block fence support columns. In addition, the vertical rebar had to be positioned before the concrete could be poured and after the pouring the horizontal rebar positioned. This was all accomplished on day one. Day two saw the entire block fence (200 linear feet X 6 feet in height) completed as well as all the post installation clean-up. Day three was only for the installation of the two gates. The professionalism, courtesy and craftsmanship of your employees, and your organizational skills are the reasons for the project’s completion on schedule. Both my wife and I had concerns if the time frame would be met. Our concerns were soon put to rest with the completion of the block laying on day two of the contract, which was ahead of schedule. We are happy to recommend you and your staff to all our friends and neighbors. I am writing to thank you for doing such a good job on my yard. I have had the pleasure of working with your company twice. In 2005, you installed a new block fence around 2/3 of my yard. In 2009, you replaced an existing fence that was on the other third. The fences in my yard all look fantastic. The crew does excellent work, they show up on time, finish promptly and clean up as if they were never there. It is nice to do business with a company that is as reliable, courteous and efficient as Progressive Fence. I would definitely use you again and would highly recommend your services to others. On behalf of my family and myself, I want to thank you immensely for the six-foot block wall you installed recently around the perimeter of our backyard. 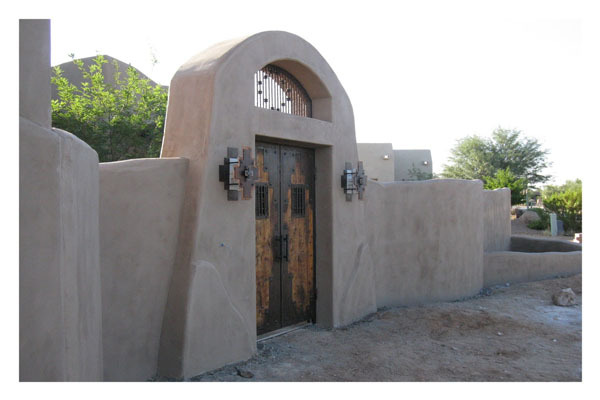 The workmanship was superior, the professionalism top-notch, and the time that it took to dig the trenches, install the concrete, and put up the wall was absolutely amazing. We couldn’t be more pleased with the results. You yourself, deserve a tremendous amount of praise for coming to the rescue in handling building inspectors and making sure we were totally satisfied as customers. It certainly has been a pleasure to work with you on this project and we have already had other neighbors inquire about your services. Hopefully, the positive word of mouth will bring more business your way. Again, thank you for putting a quality product around our home. Best wishes for continued success with your business. 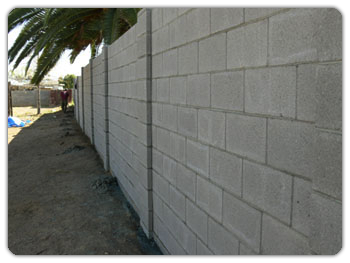 We wanted to express our thanks about what a great job was done on the block wall between our neighbor’s home and ours. Your crew was polite and the construction site was kept very clean. Your men worked hard and quickly. They arrived between 6:30 and 7:00 a.m. to begin the demolition of the old block wall and proceeded directly into digging the footings and building the new wall. We expected them to take two days to complete the job and they finished completely around 4:00 p.m. They cleaned the area completely and spread out the dirt from the footings trench on either side of the wall. There was a bit of miscomunication about the top of the wall and your willingness to make it right for us insures that we will not hesitate to recommend your company to friends and colleagues that might need your service. Thank you again for a job very well done. Completed fence has excellent appearance. Workmanship is very professional. Workers were helpful in answering questions and diligent in their work. We are very pleased with Progressive Fence from original sales contact to the finished project. I would like to recommend Progressive Fence as a good vendor. Their project manager, did more than just put in a fence for us. We had to have a huge hedge of oleanders removed prior to installing the block fence. 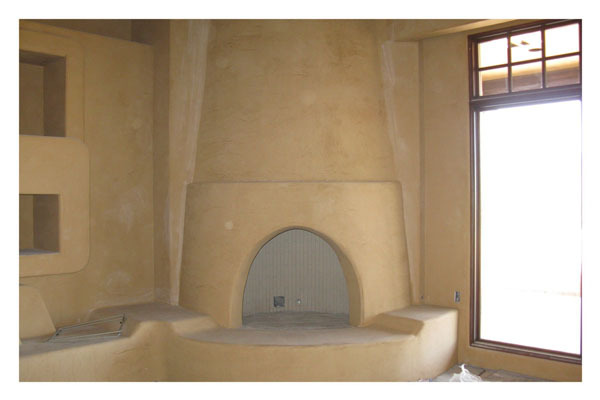 He found us a contractor, made the initial introductory call, followed their progress and kept the project on track. Additionally, they had to match new block with an existing fence and did an excellent job. You cannot see where old fence meets the new. Lastly, they met all commitments of the contract including cleanup without any prompting from us. I just wanted to take a moment to thank you and your employees for a job well done. It is unusual in today’s work place environment for contracts to be completed on time meeting all its parameters. Let me review our agreement. It called for the removal of the existing redwood fence and replacing it with a block fence with two gates in three days, In order for the work to be accomplished the redwood fence with its 4x4 fence posts sunk in concrete had to be removed. Also, your crew had to dig a 12in x 12in trench for the new fence foundation as well as dig the 3ft x 12in holes for the block fence support columns. In addition, the vertical rebar had to be positioned before the concrete could be poured and after the pouring the horizontal rebar positioned. This was all accomplished on day one. Day two saw the entire block fence (200 linear feet X 6 feet in height) completed as well as all the post installation clean-up. Day three was only for the installation of the two gates. The professionalism, courtesy and craftsmanship of your employees, and your organizational skills are the reasons for the project’s completion on schedule. Both my wife and I had concerns if the time frame would be met. Our concerns were soon put to rest with the completion of the block laying on day two of the contract, which was ahead of schedule. We are happy to recommend you and your staff to all our friends and neighbors. 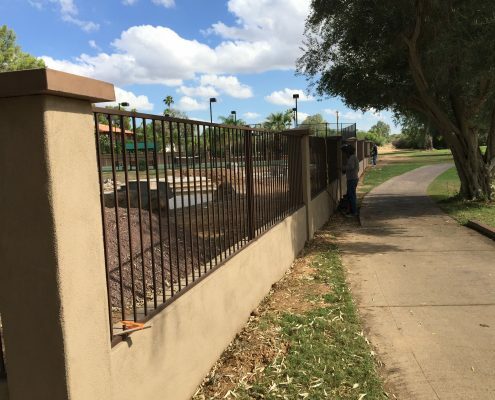 Progressive Fence Company replaced a concrete slab fence with a block fence of over 200 linear feet. There was a considerable amount of tear down work with limited access to the backyard to remove the heavy slabs and other debris. Jonathan took care of getting the necessary building permit and inspection as well as scheduling the utility line marking. Jonathan and his crew did an excellent and timely job with the entire project. He personally supervised most of the work. 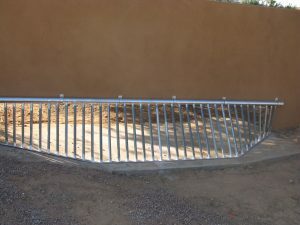 In addition to the basic fence work, they were able to relocate the sprinkler lines and replace the entry gates to the backyard with only minor difficulty. While the initial estimate had to be increased to cover the cost of removing all the dirt, the cost was reasonable. The project was finished on schedule and we are quite pleased with the result. We used Progressive Fence for three different projects and were very pleased with the results every time. Not only did they have the best price, they showed up on time, finished on time and left no mess behind. Jonathan was very helpful and offered alternatives within our budget. He returned calls and e-mails promptly and came by quickly to give us estimates. Jonathan and his workers were friendly and courteous...and on the larger job he worked with them directly supervising...we were amazed at the results. We're graphic designers and wanted perfect results...and we got it! I'm amazed at the quality of job your guys did. I have no idea how they managed to take out the broken block and replace it but one would never know it was damaged. Very impressive!!!!!!!! If we ever need any more block walls (and we may within the next year on our other property down the street) we will certainly be calling you.